As a baby-boomer, I remember a television jingle from the 1960’s, “Nothing says lovin’ like something from the oven, and Pillsbury says it best.” Like most of the kids in my generation, I grew up believing that, and by the time that I discovered that I could not tolerate gluten, sugar, or processed foods I had “loved” my way into multiple diet based allergies and illnesses. I loved the baked goods and sweets, but they clearly had not loved me back. The aroma of homemade, non-processed soup, on the other hand, stills sends my family a love-letter and turns my kitchen into a hearth. 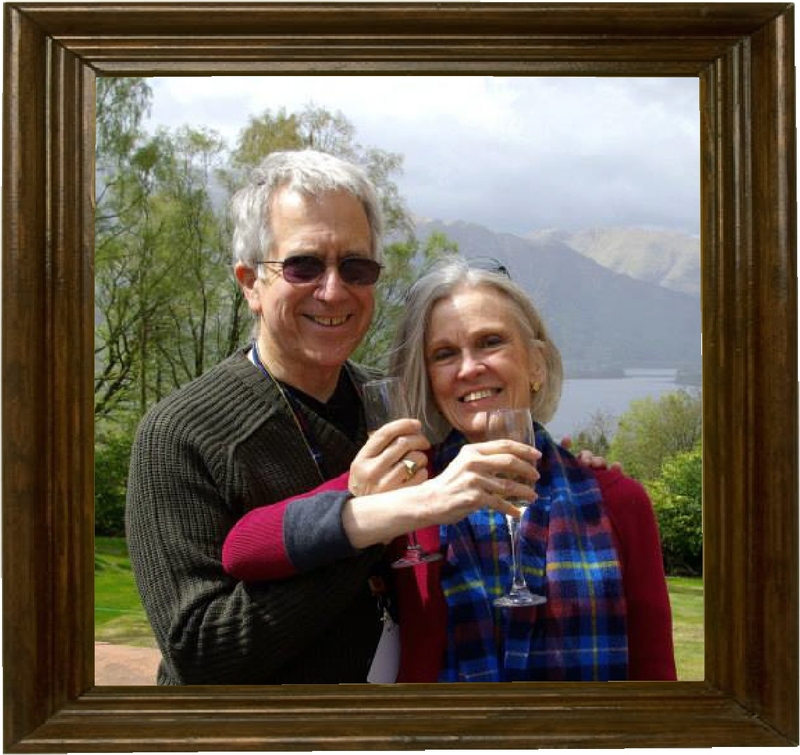 And when you have gone to the trouble to use fresh, wholesome ingredients, do the chopping and sautéing and seasoning yourself (maybe even with herbs from your own garden), and cook with mindfulness, soup or stew can become a downright spiritual experience. But not everyone knows that. When my husband and I were first married, any time that I suggested making a pot of soup, he was decidedly unreceptive. On even the coldest, rawest day of the year, soup for supper was declined. 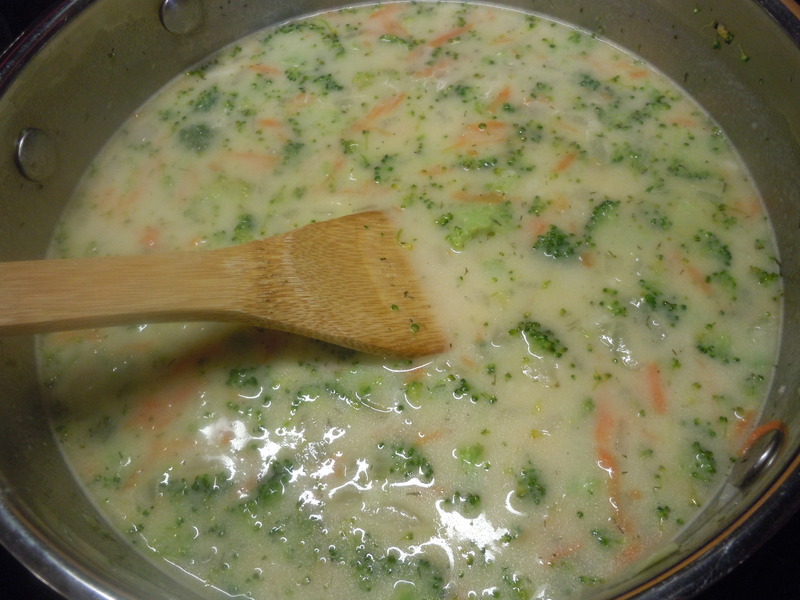 It took years for me to learn that when he was child, “soup for supper” was an option reserved for those days when no one felt like cooking and the easiest thing to do was open and dilute a can condensed soup. Life-Sustaining? Perhaps, but Soul-Satisfying? Not so much. 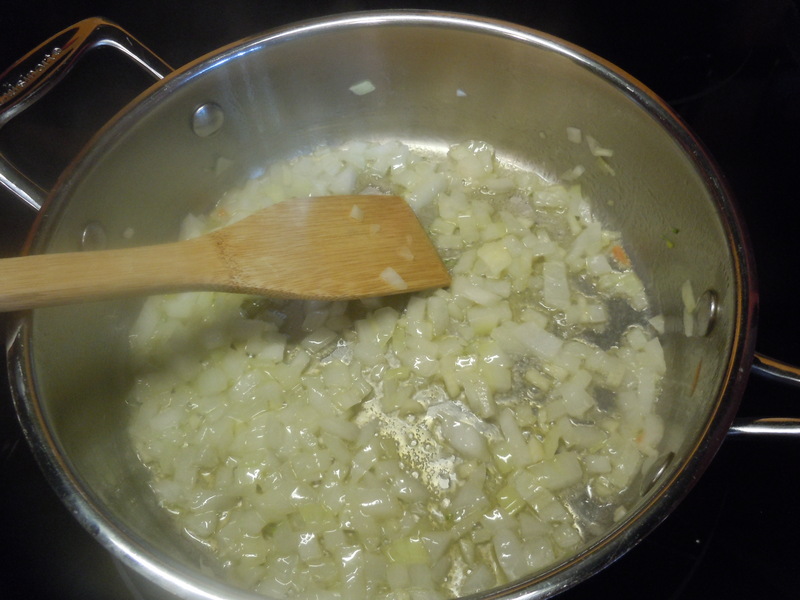 Saute the onion and garlic in the oil and butter. 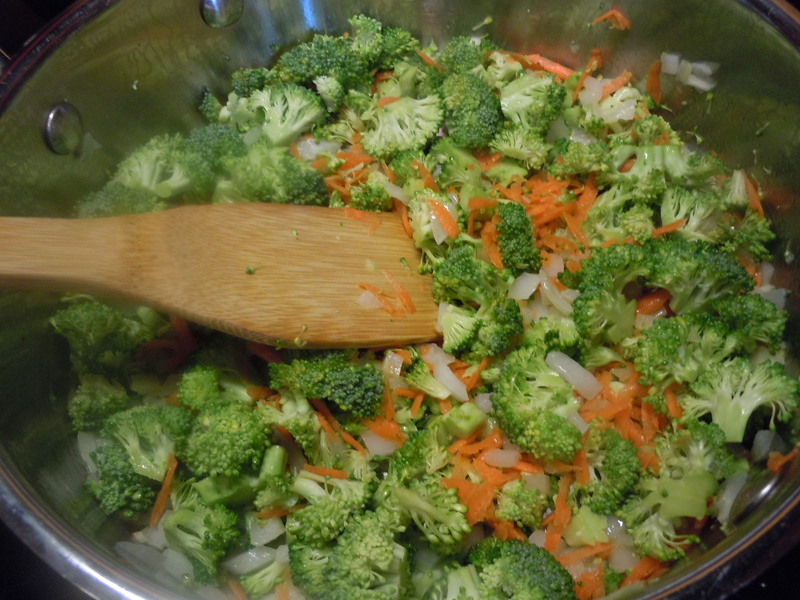 Add the carrot and broccoli and cook for two minutes. 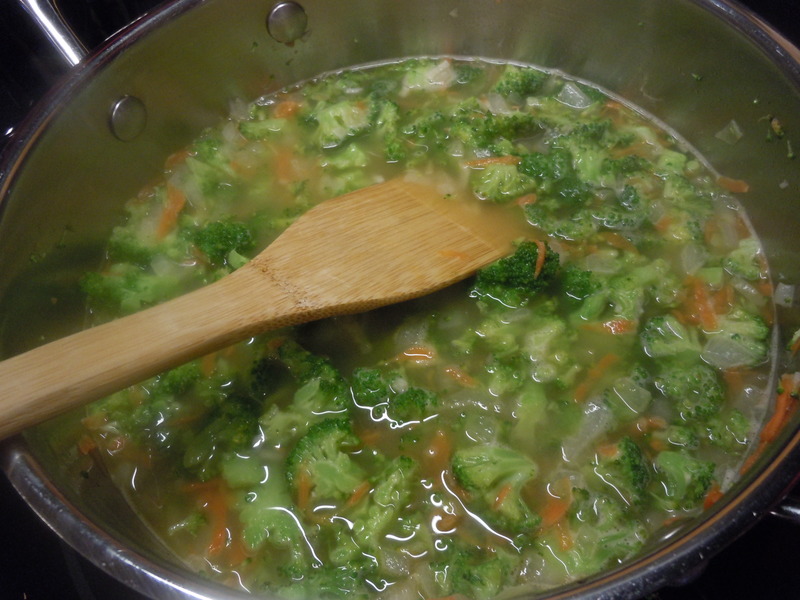 Add the chicken broth, bring to a simmer and cook until the broccoli is crisp tender. Add the cheese sauce, adjust the seasoning, and simmer very slowly for 15-20 minutes. If you prefer a more pronounced cheese flavor, add up to 1 c grated cheddar cheese before simmering. Garnish with roasted chopped almonds. Your soup looks simple and straight-forward, which is perfectly comforting to me. 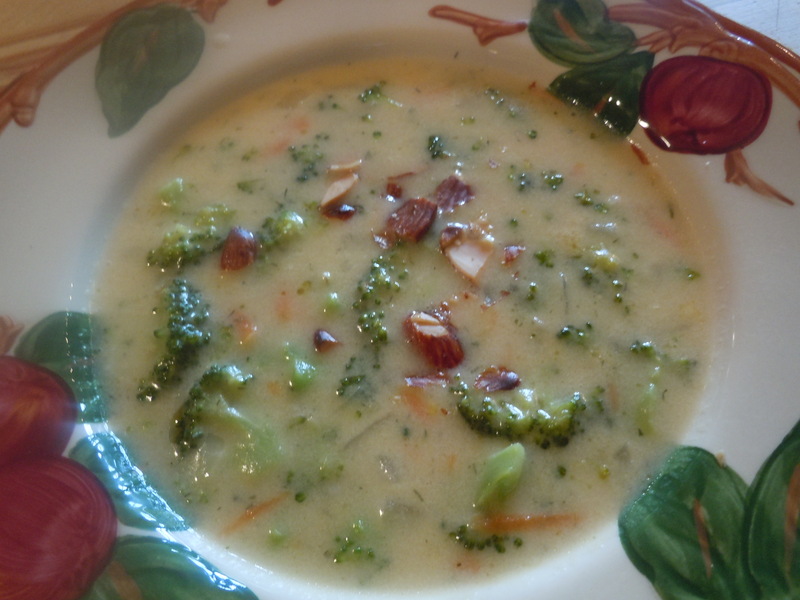 I’ll have to try it with vegan cheese and veg broth, especially since I have quite a bit of broccoli on hand already.